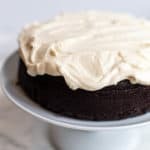 Guinness Beer Dark Chocolate Cake is an easy to prepare one layer chocolate cake that’s perfect for a special celebration or whenever you’re craving something decadent! 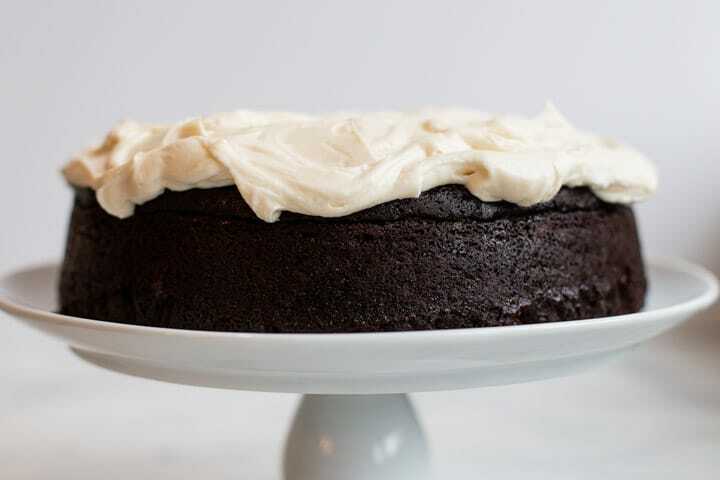 Have you always wanted to bake a cake from scratch? Well, this recipe is for you! It’s much easier than you think, and it delivers the richest, most delicious flavor. The not so secret ingredient is Guinness beer – yes beer! I promise you and your loved ones won’t get tipsy eating this cake. In fact, you won’t even taste it in the cake – you’ll just taste the deep nutty flavor of chocolate. What equipment is helpful when making this recipe? This is the stand mixer I used to make the cake, but a hand mixer will work too. I used this 10 inch spring form pan, but a straight sided tube pan or an angel food pan like this will work too. If you don’t already have this spatula, I highly recommend it for scraping the batter and frosting out of the bowl. This spatula is great for spreading the frosting over the cake. It’s an indispensable tool in my kitchen. How do I decorate the cake? 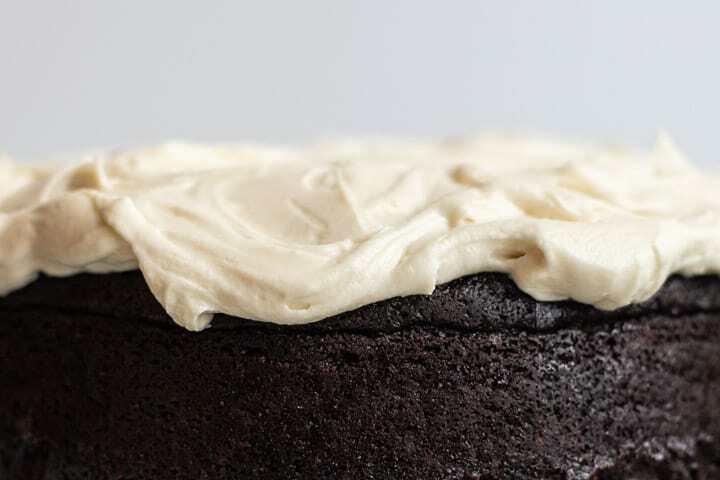 No special skill is needed to decorate Guinness Beer Dark Chocolate Cake. As you can see, just spoon the frosting onto the middle of the cake and spread it to the edges in a swirl like motion using this spatula. Alternatively, you could smooth it out completely and frost the edges. 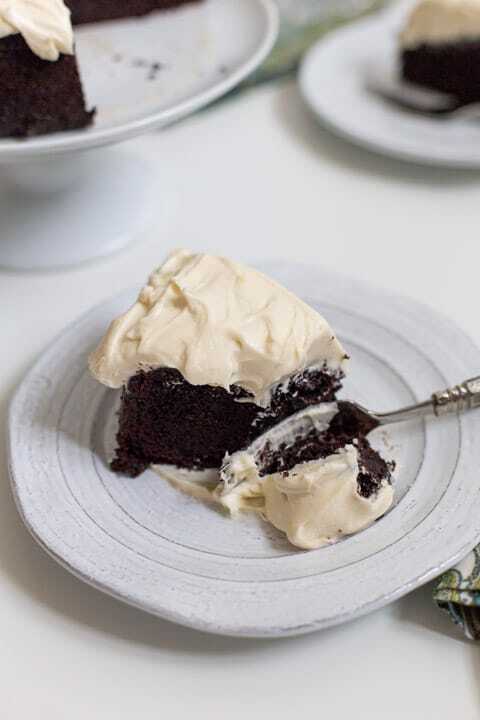 If you want to drizzle it with a chocolate ganache (a glossy chocolate icing) try my favorite recipe from Ina Garten. Are you ready to throw out your boxed cake mixes and be a scratch baker? While this recipe requires a few more steps, they are so worth the flavor pay off. Give this recipe a try and let me know how it turns out! Preheat oven to 350. Grease and line a 10 inch springform pan. Alternatively, you can use an angel food pan, or another straight sided tube pan. Combine butter, Guinness beer and cocoa in a saucepan over medium heat. Stir until butter melts then set the mixture aside to cool slightly, about 10 minutes. Add flour, baking soda, and sugar in a large bowl of an electric mixer. Mix well. Add cooled Guinness mixture to the dry ingredients along with the vanilla, eggs, and sour cream. Mix until well combined. The batter will be quite thick. Pour batter into prepared pan. Spread the top evenly with a knife or spatula. If using the springform pan, bake for an hour and 15 minutes, or until the center is set. If checking for doneness with a toothpick or wooden skewer, there will be a few moist crumbs sticking to it. That’s good! If there is uncooked cake on it, then put the cake back in the oven and bake another 5 minutes. Check for doneness again, then every 5 minutes until the cake is done. If using a tube pan, check the cake for doneness after an hour. Let cake cool in pan for 10 to 15 minutes. Carefully remove from pan and let cool completely on a wire rack. 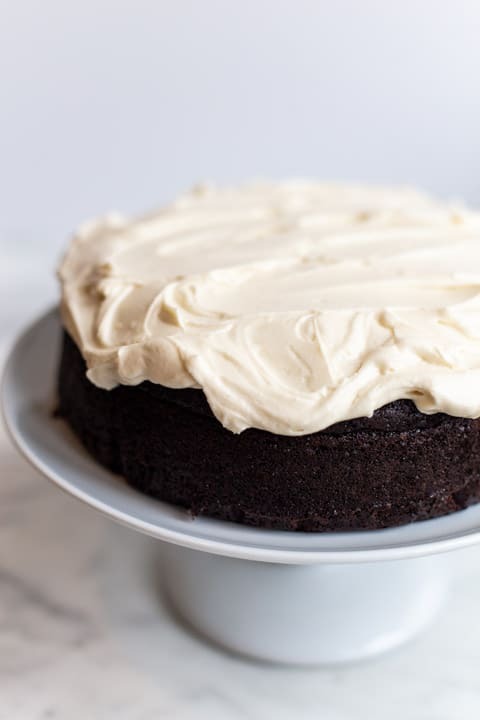 When the cake has cooled completely, spread the top with cream cheese frosting. Combine softened cream cheese, powdered sugar, and vanilla extract to the bowl of an electric mixer. Beat well until smooth, but don’t over mix. Store any leftover frosting in the refrigerator for several days, or in the freezer for about 3 months. For best results, keep the cake in the refrigerator. Before serving, bring it to room temperature by leaving it out for about 2 hours. This recipe was inspired by Katie Quinn Davies’ recipe. 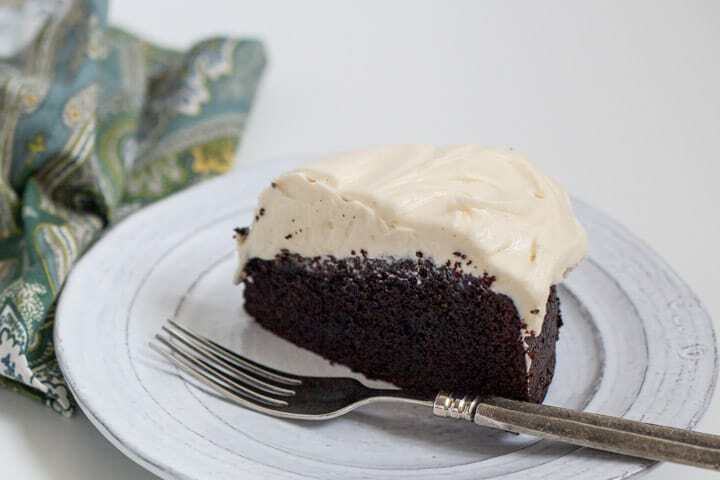 If you made Guinness Beer Dark Chocolate Cake, or any other recipe on the blog, don’t forget to leave a rating and a comment below. I love hearing from my readers! You can also find me on Facebook, Instagram and Pinterest!